Richard Mouw, Ph.D., a recognized leader in interfaith theological conversations, will visit campus Nov. 16 to discuss Catholics’ interaction and collaboration with people of evangelical faiths. “Evangelicals and Catholics: New Opportunities for Mutual Understanding and Cooperation” – open to the public and media – will be held at 7 p.m. in Conference Room A of the University Center. Mouw has returned to teaching as Professor of Faith and Public Life at Fuller Theological Seminary in California after serving as the institution’s president for 20 years. 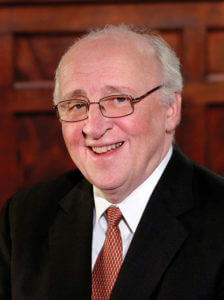 Mouw served as professor of Christian philosophy and ethics at Fuller from 1985-89 before going into university administration. Before that, he was professor of philosophy at Calvin College in Grand Rapids, Michigan, for nearly two decades, as well as a visiting professor at the Free University in Amsterdam. He has written 19 books – including The God Who Commands, Calvinism in the Las Vegas Airport, Praying at Burger King, and Talking with Mormons: An Invitation to Evangelicals. He also has been editor of the Reformed Journal and a panelist in the Washington Post online forum, On Faith. The Catholic Intellectual Tradition Lecture Series is a free, annual series featuring men and women who have shaped the Catholic intellectual tradition at the heart of the educational enterprises at St. Mary’s. The theme for the 2016 series of four lectures is Reshaping Catholicism in a Pluralistic Society, and features speakers from various faith traditions. For more information, call 210-431-8094.